Nutri Ninja is one of the brands that make affordable and yet quality blenders for consumer use. One of their products, Nutri Ninja Blender Duo with Auto-iQ (BL642) is something extraordinary. Here, I’m going to break down why this blender is something that you should really own for yourselves. 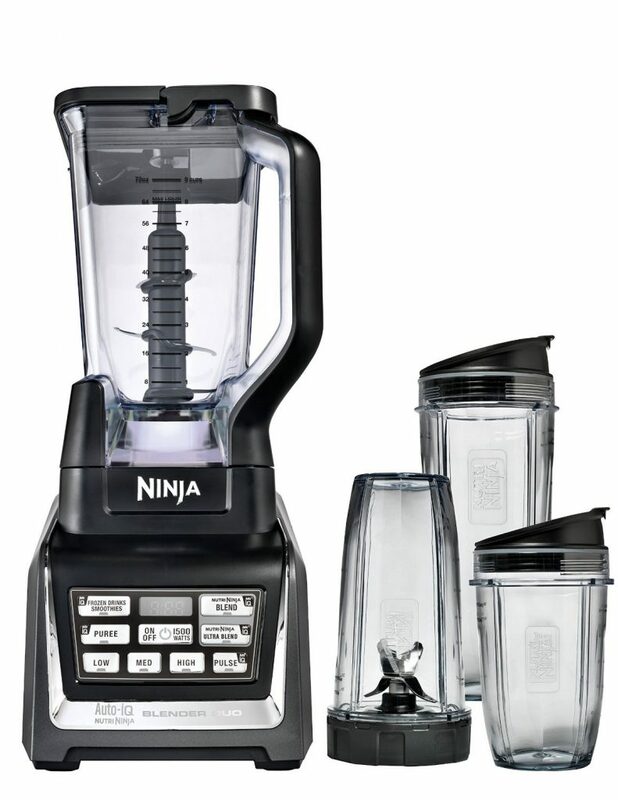 The Nutri Ninja Blender Duo comes with a 7 x 10 x 17.5 inches dimension and 10.1 pound weight. In the package are 4 containers. First is the 72 oz pitcher, and 3 other personal cups (Jumbo sized 32 oz, Regular sized 24 oz and Small sized 18 oz). Each of the cups comes with their individual sipping lids. All containers are BPA free and dishwasher safe. At the bottom of the base are 4 suction cups which are designed to stick the blender onto the table while you blend. This will make sure the blender won’t move during blending. 1500 watts (or 2 HP) motor powers this blender. Yes you read it right. This blender has the same power as other high end blenders. So please expect some very loud noise coming from this blender will ya! There are two blades that comes with this blender. The tall column stick is to be used with the 72 oz pither and has 3 pairs of blades at different height along the stick (totally something new there!). Another blades are smaller and to be used with the personal cups. On the base, you can see there are 3 speed settings : Low, Medium and High. There are also 5 others Auto-iQ pre-programmed settings: Puree, Frozen Drinks Smoothie, Pulse, Nutri Ninja Blend and Nutri Ninja Ultra Blend. Duo? Auto-iQ? What Do That Means? Surely all of you are wondering what the heck do Duo and Auto-iQ mean right? 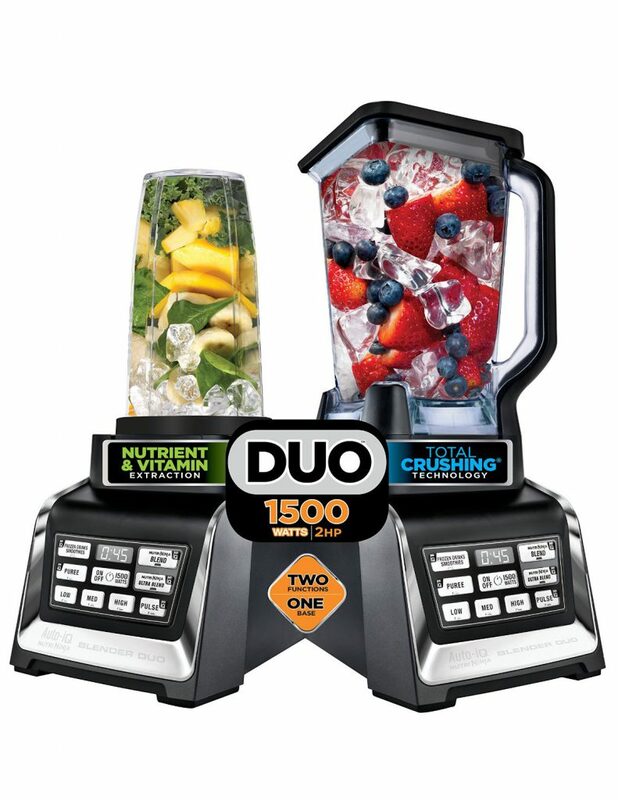 Well, to put it simply Duo means the Nutri Ninja Blender Duo can function as a total crushing blender to make smoothie or puree maker (using its 72 oz pitcher) and also a nutrient extractor when coupled with its personal cup. This makes the Nutri Ninja Blender Duo a very versatile blender! Auto-iQ means the blender is loaded with 5 pre-programmed settings (Nutri Ninja Blend, Nutri Ninja Ultra Blend, Puree, Frozen Drinks Smoothie and Pulse). All of these settings have been comfigured by Nutri Ninja to give the best combination of pulsing, some moment of pause (to get the ingredients of drop down), then more pulsing, and lastly continuous blending. All of the 5 settings have different combination of the blending action for the intended function. There is a timer display at the front to track the remaining time. All you need to do is load the pitcher/cup with ingredients, secure it on top of the blender base, push your intended setting, then you can walk away doing other things while the blender take care of its job. It’s that simple! The difference between the Nutrient Extractor and the Total Crushing Blender is the pitcher (and blades) you used. Using the personal pitcher cups and its extractor blades, the blending action is concentrated in the small volume of the cups only, as oppose to the huge 72 oz pitcher. What this does is the blending and cutting of the ingredients will be more thorough, giving you very small particles of fruits and vegetables. The Auto-iQ function that can be selected when using these cups are the Nutri Ninja Blend, Nutri Ninja Ultra Blend and Puls. The term “Nutrient Extractor” (actually sounds almost the same with Nutribullet’s “Nutrition Extractor”) is a bit too gimmicky for me. I think there is nothing to be extracted here. The nutrients are still inside the fruits and vegetables particles and fluids. It’s not like you can extract it completely from there. You still have to drink that stuffs to get all the nutrients. What the blender actually do is chopping all of those into very tiny pieces so that our body can easily absorb all the vitamins and minerals present there. And this blender is doing that just great! Total Crushing Blender uses the big 72 oz pitcher with its 3 pairs of blades column. This is a very revolutionary design by the Nutri Ninja. By using this combination, the blender is able to pulverize everything; ice, fruits, vegetables, etc into bits and pieces. Auto-iQ settings that can be selected in this mode is only Puree, Frozen Drinks Smoothie and Pulse. The major difference is the total crushing blender mode does not really break everything into very small particles. I would recommend the Nutrient Extractor mode to make your smoothie instead as it will thoroughly break down everything into smooth and silky smoothie drinks. The Nutri Ninja Blender Duo with Auto-iQ BL642 is a very good blender. It is affordable and with its 1500 watt motor, it can surely can do a lot of things. And did I mention how you can get 3 separate personal cups as well as a big 72 oz pitcher with this blender? No other brands are more generous than Nutri Ninja in this aspect. For an affordable and versatile blender, that comes with huge amount of blending power, you cannot go wrong with a Nutri Ninja Blender Duo BL642. Currently Amazon has a huge discount on this blender. Click the link below to check out the best deals for Nutri Ninja Blender Duo with Auto-iQ BL642 on Amazon. Total crushing blender! Well definnitely don’t put your hand in it! I’m always worried about that with my own blender, that somehow I’ll accidentally blend my hand or something. Do you ever worry about that kind of thing? I see that this is currently reduced a lot on Amazon – nearly half price actually. That’s a great deal. This definitely looks a lot better than the blender I own. My blender definitely can’t turn ice into snow. Well, actually I never thought of that lol! The thing I always am conscious is to not touch the blades, especially the blades of Nutri Ninja Blender Duo. Those are very sharp! Yes the discount is unbelievable and definitely a steal! For less than $200, you are getting a powerful blender, one big 72 oz pitcher, and 3 personal cups. Totally worth it Marcus! wow ! this is a blender on steroids! I’ve not seen this one yet. Currently i’m using a Blendtec and I do like it. However, there are occasions when i wished it had a tamper because when it’s full to capacity, sometimes i need to give it a good shake. Has this ever happened to you with the Nutri Ninja Blender Duo? Among the usual comments on the Blendtec is the tamper. It really is frustrating for this to happen. I can’t guarantee the same will not happen with the Nutri Ninja Blender Duo, as if you put in lots of hard ingredients in the blender, for sure some of them will not mix very well. Even the great Vitamix need a tamper to push the ingredients down..
What I can suggest Jackie is to put your ingredients by portion. Blend the hardest things first, then put in the remaining ingredients in stages. With this, the blender motor don’t have to work so hard to blend everything in one shot. Even though it’s a bit cumbersome (well, tamper also is cumbersome..right? ), the final blended product will have much better consistency and smoothness. Btw, this works great for lower end blenders (those less than $100). Cheers! This is the first time I’ve seen the Nutri Ninja Blender Duo, it seems amazing. I’m on the market for a new blender and this may be the one. The fact that it comes with a nutrient and vitamin extraction feature is crazy! If you like to juice a lot, or make smoothies all the time like I do this is a good machine to try. Thanks for sharing the review. Hi there. Yes the Ninja Blender Duo is a good blending machine. Best part of it is of course the duo function as it gives you lots of flexibility. If you want to make a smoothie for yourselves only, then the nutrient extractor (i.e small pitcher) can be used so that you don’t have to clean the big jar. If you want to make smoothie for the whole family, the normal blender pitcher is perfect. A truly great blender indeed. Thanks for reading! I am searching for a powerful blender that’s gonna last for a while and won’t break down the next year. I presume this one is capable of breaking nuts and walnuts? I went to the link you provided and there are 3 versions that I can pick from. One is more expensive than the other. What exactly is the difference and which one do you think I should pick? This blender looks amazing!! I’m not even kidding when I say to you that I have a blender literally from the 60s. It’s awful. And probably wildly dangerous. With technology advancing so fast and my utter lack of motivation to do research, this blender has been in the family for generations. 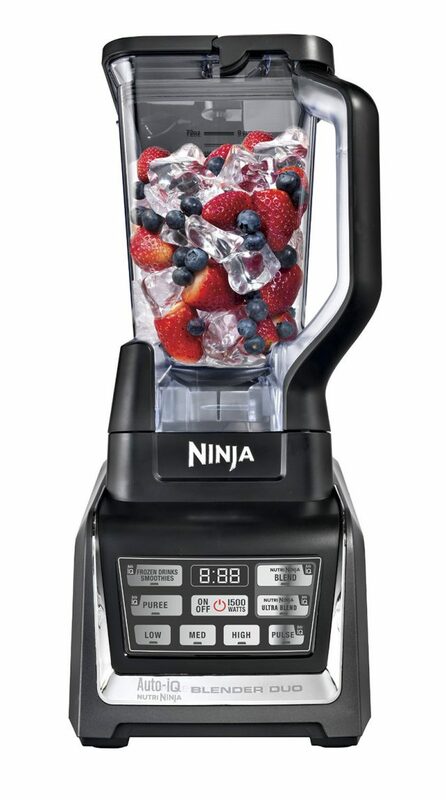 This blender looks like an awesome choice. Powerful and affordable. Two very hard things to find together.